Turn any laptop into a console for headless servers, PCs, ATMs, Kiosks and more! 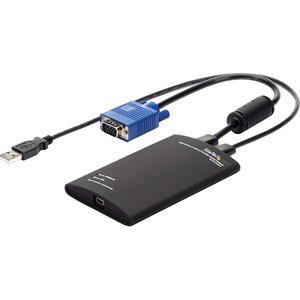 StarTech.com's USB 2.0 Laptop KVM Adapter turns your notebook or netbook into a guininely portable server crashcart, eliminating the need to lug around a large, heavy and awkward video screen, keyboard, and mouse. 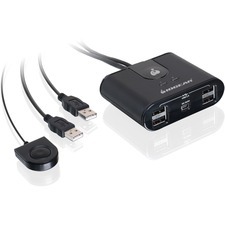 This adapter delivers the VGA stream from any host computer to a laptop and emulates the laptop mouse and keyboard outputs, for simple access and control of connected servers, PCs or other "headless" devices. 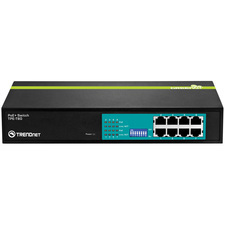 With portability for the mobile administrator or repair technician in mind, this self-powered adapter features a small-footprint design that requires no additional accessories to connect to most servers, and requires no server-side software installation. Plus, the pocket-sized adapter draws its power from the server-side connections, allowing the laptop/netbook to last longer without consuming battery power. Ensuring full control of the connected units, the Laptop KVM Server Console Adapter provides immediate access to the BIOS post and the ability to handle full configuration of the attached PC or machine; administrators can connect to a headless server/device without the need of an expensive LCD rackmount console or bulky monitor, keyboard, and mouse solution.